FD-MLJ, Syndicate – Responding to the destruction of prototype citadel construction sites by various capsuleer attackers yesterday, Special Accounts Manager Lee Brinalle held a press conference this afternoon on behalf of the Upwell Consortium, during which she cited evidence of Serpentis sabotage of the sites' defenses. Speaking from the Intaki Bank Depository in FD-MLJ, Lee Brinalle's statement covered a number of points, including the probable cause of the vulnerability of the construction sites and Upwell's response to the apparently opportunistic and, in some cases, organized attacks by capsuleers on the citadel prototype sites. Off the record sources within Upwell affiliated corporations have indicated that consortium leadership is "vexed but relatively unperturbed" by yesterday's sequel to the construction project launch ceremonies. For her part, Special Accounts Manager Brinalle's delivery of the Upwell statement was typically forthright. 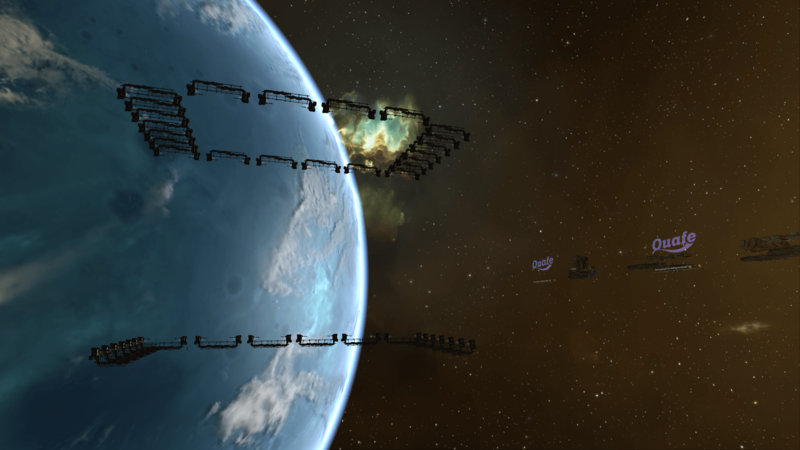 "For the record, I can confirm reports that the five construction sites the Upwell Consortium established for the assembly of prototype exemplars of our Astrahus-class citadel product were raided, attacked and ultimately destroyed by various independent capsuleers and capsuleer organizations. I am also able to confirm that the construction sites were rendered vulnerable by simultaneous failings in the security and shielding systems of the sites and the associated infrastructure that had been placed in them. "I wish also to correct reporting from some quarters that yesterday's attacks destroyed prototype citadels in whole or in part. This is not so. Much valuable construction, testing and nanorecording equipment was destroyed, together with stores of components, fuel and the like. However, I would remind the more credulous members of the press that by very simple logic a newly-established construction site is not the thing that is to be constructed there." At this juncture, Ms. Brinalle gestured to representatives of those news outlets dedicated to producing "sensational" news summaries for the capsuleer market. Continuing with her remarks, Ms. Brinalle revealed details of an intrusion that Upwell are claiming is evidence of sabotage by the Serpentis Corporation. "Following the initial attacks, which took place very swiftly after the sites were established, the Upwell Consortium's investigative apparatus quickly detected signs of a wide-spread computer virus attack on the security and shielding systems of the sites. Further investigation has indicated that this computer virus uses artificial intelligence and information mutation techniques outlawed by the Yulai Convention. Upwell's Department of Friendship and Mutual Assistance has been given responsibility for coordinating the investigation and response to this insidious act of sabotage and the outrageous events to which it led." Following the claims of sabotage, the Upwell statement addressed the involvement of independent capsuleers in yesterday's events. "As for the action of capsuleers yesterday, we want to begin by noting that in the wake of the attacks themselves a considerable number of capsuleers decried the raids and we know that several pilots recovered Upwell staff in distress, providing assistance and transport to medical facilities as necessary. We would like to commend these actions and say very clearly that we reject the common caricature of the capsuleers as uniformly bloodthirsty, dishonorable and selfish. 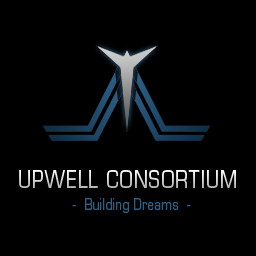 "Furthermore, where other corporate entities in New Eden would consider these events an unmitigated disaster and endeavor to downplay the events of yesterday, the Upwell Consortium believes that full transparency will only help solidify the future of the Citadel Project. Our members and investors remain confident that our shared vision of revolutionizing space colonization and infrastructure is one that is shared also by the mass of capsuleers. We are on a path to realizing the revolutionary, beneficial changes that citadels will bring to our civilization among the stars, while providing platforms for our capsuleer citizens to help build and shape the future for us all. "Having said all this, we utterly deplore the attacks on our equipment and people by those capsuleers who chose the path of opportunism and insensate violence. We know that many of these wanton acts were almost random and unthinking, with the destruction of most sites a consequence of the cumulative acts of barbarism perpetrated by the vandal capsuleers. However, in at least one particularly egregious act of systematic destruction, a site was razed by the organized, collective action of members of a capsuleer alliance resident here in Syndicate. The members of 'The OSS' alliance should be in no doubt that their actions will have consequences. "In the first place, all current and future individual members of 'The OSS' are barred from participation in Upwell Consortium research and prototyping efforts, with immediate effect. If any members of those organizations have already contracted components to me they may take this statement as notice that such materials are forfeit. Secondly, while this alliance has been a valuable customer of Intaki Bank services, not least here on this station, we will be reviewing the relationship. No precipitate action will be taken but the Intaki Bank, and other Upwell Consortium members, reserve the right to cancel agreements, without notice or refund, if aggressive acts of the kind we have seen continue. Certainly, in this region it is the Station Owners Council of the Intaki Syndicate that, to quote ISP Security Commander Elteroumie, 'says what goes and what don't go'. My advice is that certain parties should bear this in mind. "Now, m'sieurs and m'dames, we will later share a more thorough, up-to-the-minute report with your news organizations and we will be certain to notify you when we are ready to resume the construction initiative. We expect this to be in a matter of days, just as soon as the Department of Friendship and Mutual Assistance is satisfied that the relevant systems have been purged of foreign routines and, indeed, after we have taken steps to correct the vigilance of technical staff at the sites. "It could be argued, and I do argue, that the actions of the Serpentis and a few renegade capsuleer corporations have allowed us to refine our plans in invaluable ways. More importantly, the Upwell Consortium values our strong relationships with capsuleers across New Eden and we know how important their contributions have been to the universe we share. We will not let a few rogue actors deter us from delivering a marvel of engineering to the majority of the pilots of New Eden. "On the financials, this was certainly a loss but, frankly, at this stage the loss was minor. That said, to alleviate any concerns going forward, we will be renewing construction of the prototype citadels and we are maintaining our request for the required research components from capsuleers across New Eden. All defensive measures will be active at the re-established sites and construction should continue normally. We believe unwavering adherence to our path forward sends a stronger message to the future of new Eden than suspending progress indefinitely or hunting down nihilist gangsters. "After all, the Citadels themselves represent defiance. Defiance against the inherent dangers of space. Defiance against impossible odds and inconceivable logistical problems. They are the future of humanity and we shall remain resolute in the face of any and all that would attempt to challenge or block the realization of this vision." Ms. Brinalle declined to take questions from the floor and the Scope has been unable to secure an interview with any official of Upwell Consortium or its member corporations on these matters.